So you want to learn to juggle?…. 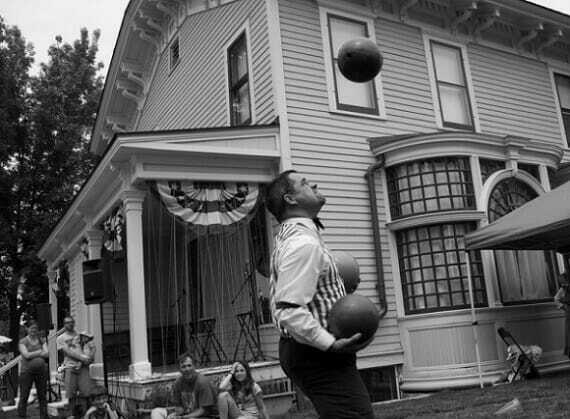 Over the years I’ve developed quite the talent for being able to juggle. In fact, I’ve often wondered if somehow that should be worked into my job title: Andre Buck, Master Juggler/LeadExec Partnership Specialist. When I say juggle, I’m not referring to flaming batons or chainsaws, but rather tasks, duties and responsibilities (which all seem to have the same dire consequences if dropped). In a startup company, this talent for juggling might be one of the most sought after and pivotal abilities required in every position that we currently staff at ClickPoint Software. Everything must remain fluid or the company can’t function as balls are dropped. Even though some people have a freakish natural ability to juggle, most of us mortals have to be taught. But where does one to go to learn to improve this skill? At the core, juggling or “multi-tasking” is the ability to organize and execute multiple tasks simultaneously. It goes deeper than that though, especially when you’re juggling questions, concerns, support requests, accounts, development, management and coworkers. A mix of organization, prioritization and creativity will keep things moving, even when the volume coming through would typically jam up the pipes. Here are some things that I use to keep my juggling fluid. I keep a notepad with me at all times with a series of checkboxes in a list of tasks that I need to complete. I generally leave a few lines in between each checkbox so that I can append notes to the tasks as updates come in throughout the day. At the end of my day, anything remaining on my checklist gets moved over to the top of the list for the next day. I rely on daily meetings with my team to ensure that all of my tasks are on their radar as well, so if something comes in while I’m indisposed, they’re able to keep that ball from dropping. This requires fluid teamwork as well as dedication to your coworkers. Building trust with your coworkers is essential to this model. If they can’t trust you to help them when they’re overwhelmed, they aren’t going to jump at the chance to help you when you’re in that same position. At ClickPoint we’ve worked very hard at developing our own internal administration system to assist in tracking the amount of inbound requests we receive. Having the right system in place has lightened our loads tremendously by making our office more efficient. Before we created our administration system we were forced to rely on e-mail tracking and notes that we had taken individually. This crude system worked for a time, but as our volume started to ramp up we became overwhelmed and small mistakes followed. My ability to create an effective system here did not come without a few bruises to the ego. The best thing to do in that situation is to own it and learn from it. Luckily, we have some great people in our company and were able to collaborate to create a system that was tailored to our operational needs. Since we’ve adopted our new internal administration system our efficiency has exploded like a volcano. Take the initiative and look at your day-to-day activities. Think about all possibilities to organize them better. Think about the order in which you do things and if that’s productive to your end of day results. There are thousands of resources to assist in fine-tuning your organizational skills. Getting ideas and different perspectives never hurts. At the end of the day, organization is what will keep things moving. If what you’re juggling is as demanding as fire or a chainsaw, you cannot afford to lose track of anything. This entry was posted in Business & Life on November 9, 2011 by Gabriel Buck.